Apple today said it sold more than 10 million iPhone 6 and 6 Plus smartphones during the first weekend of sales, an 11% increase over last year's launch of the iPhone 5S and 5C. The 10 million was a record for Apple. The 10 million included units sold through its own retail stores, those through its carrier partners' stores, and the ones that were delivered Friday or Saturday from pre-sales on its online store which started Sept 12. Apple began selling the iPhone 6 and 6 Plus at retail early Friday. "Sales for iPhone 6 and iPhone 6 Plus exceeded our expectations for the launch weekend," said Tim Cook, Apple CEO, in a statement. Cook also boasted that the new iPhones "shatter[ed] all previous sell-through records by a large margin." Although the 10 million was a record, Cook's use of "large margin" was stretching it. Last year, Apple reported that it sold more than 9 million iPhone 5S and 5C smartphones during its first three days of availability, or 80% more than the first weekend sales of 5 million iPhone 5 smartphones in 2012. This year the difference was approximately 1 million more than 2013, with a year-over-year increase of 11%. Cook also acknowledged iPhone 6 and 6 Plus shortages, as he did last year when the iPhone 5S was impossible to find in its early on-sale days. "While our team managed the manufacturing ramp better than ever before, we could have sold many more iPhones with greater supply and we are working hard to fill orders as quickly as possible," Cook said. 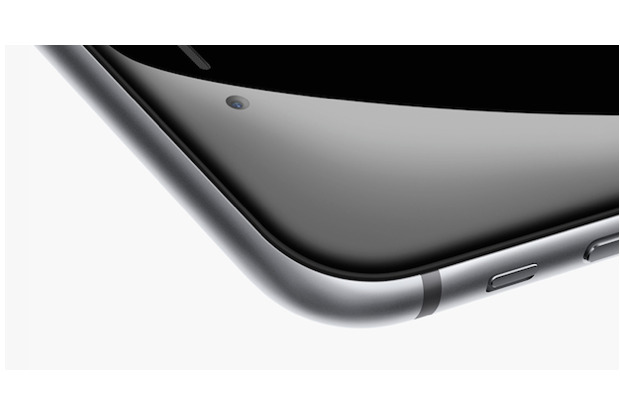 Currently, both the iPhone 6 and 6 Plus are sold out on Apple's online store. The shipping delay for the iPhone 6 is seven to 10 business days, considerably shorter than the lag of the iPhone 6 Plus, which on Monday remained at three to four weeks. Inventory of both the iPhone 6 and 6 Plus was quickly exhausted on Sept. 12 when pre-sales started, but the iPhone 6 was available for delivery on Sept. 19 for hours longer than the 5.5-in. iPhone 6 Plus. The 10 million sold over the weekend was not surprising: A week ago, Apple announced that it had sold 4 million iPhone 6 and 6 Plus devices in the first 24 hours of pre-sale availability. The last time that Apple allowed pre-orders of its flagship iPhone was in September 2012, when the company said it had sold 2 million iPhone 5 smartphones in the first 24 hours. (In 2013, Apple took pre-orders only for the iPhone 5C, not for the higher-priced iPhone 5S.) Later, Apple said it had sold 5 million iPhone 5 smartphones on opening weekend. Using the pace of pre-sales in 2012, which were 40% of the opening weekend, Computerworld last week pegged a three-day total this year of 10 million. Cook gave no hint of when supply and demand would be in balance, but by past years it could be months. In 2012, for example, it took Apple two months to move the shipping delay for the iPhone 5 from "three to four weeks" to "two to three weeks," then another week to lower the lag to "two weeks." Even with the shortages, Apple will stick to its plan to roll out the iPhone 6 and 6 Plus in another 22 markets on Sept. 26, including Italy, the Netherlands, Russia, Spain and Taiwan. The company promised that the new iPhones would be available in 115 countries by year's end. 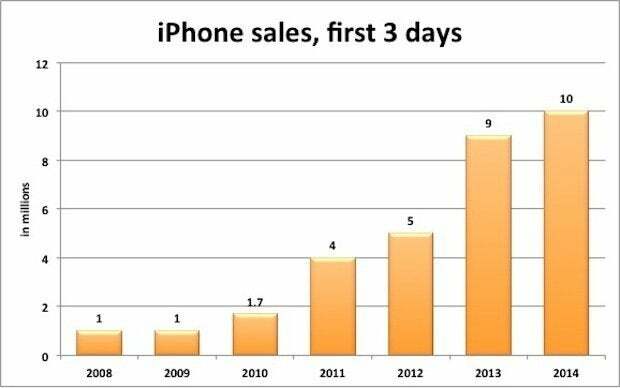 Opening weekend sales of Apple's newest iPhones were 11% greater than in 2013.